New Year, New Book Culture Selects Picks! A bit of a slow start but the idea itself will keep you invested. A world with no more death-- only a select few have the power to decide when it's someone's turn to be 'gleaned'. A whole separate world with it's own separated government is surely destined to become toxic. So toxic that they set two Scythe Apprentices against each other-- one will win the Scythe ring, the other will be 'gleaned' by the victor. A wonderful novel that occasionally hits a little too close to home in our current political standing. In a literary world oversaturated with dystopian futures, National Book Award winner Neal Shusterman offers up a delightfully biting and fresh utopian alternative: a world where technology has solved all of humanity's problems, including mortality. Only Scythes-- specialized, righteous, impartial assassins-- decide who dies. They are meant to be beyond corruption, above reproach. But our two heroes, while training as Scythe's apprentices, learn the reality is a distant cry from such moral heights. 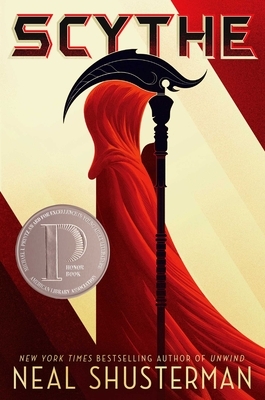 Scythe is harrowing, subtle, and thoroughly unputdownable. — From New Year, New Book Culture Selects Picks!